By pulling together cultural and political history; the studies of religion, race, and gender; and the ghostly, Kathryn Troy offers a new layer of understanding to the prevalence of mystically styled Indians in American visual and popular culture. The Specter of the Indian unveils the centrality of Native American spirit guides during the emergent years of American Spiritualism. By pulling together cultural and political history; the studies of religion, race, and gender; and the ghostly, Kathryn Troy offers a new layer of understanding to the prevalence of mystically styled Indians in American visual and popular culture. The connections between Spiritualist print and contemporary Indian policy provide fresh insight into the racial dimensions of social reform among nineteenth-century Spiritualists. Troy draws fascinating parallels between the contested belief of Indians as fading from the world, claims of returned apparitions, and the social impetus to provide American Indians with a means of existence in white America. Rather than vanishing from national sight and memory, Indians and their ghosts are shown to be ever present. This book transports the readers into dimly lit parlor rooms and darkened cabinets and lavishes them with detailed séance accounts in the words of those who witnessed them. Scrutinizing the otherworldly whisperings heard therein highlights the voices of mediums and those they sought to channel, allowing the author to dig deep into Spiritualist belief and practice. The influential presence of Indian ghosts is made clear and undeniable. In her 1885 book Life and Labor in the Spirit World, Mary Shelhamer, the sitting medium for the primary Spiritualist journal the Banner of Light, recounted her visit to the ghostly realm. “Beyond [a] rolling river,” she wrote, “there is a deeply-wooded country. Here you are up high among the mountains; this is the red man’s home […] it is a refuge for the poor, hunted and despised Indian, who, fleeing from mortal chains, finds therein rest and peace.” Her description of Indians as figures in flight, as members of a dying race, was by the late nineteenth century a common one. For many white Americans, Indians were, for the most part, already a thing of the past. They appeared constantly in popular culture as figures of legend and literature, but real Indians were primarily perceived as living relics—faint reminders of a vanished people. But to nineteenth-century Spiritualists, Indians had never completely gone; the ghosts of Indian dead walked among them. The proclaimed presence of Indian spirits in American séances challenged the dominant discourse of Indians as vanished, and had a profound impact not only on the Spiritualist movement, but also on some of the most important debates of the day—those on race, gender, civilization and the development of an American national character. 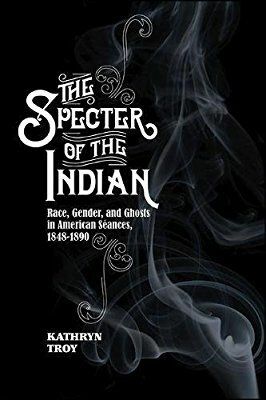 This book explores the spectral appearances of Indians in late nineteenth-century American séances in relation to those national debates, and analyzes the importance of such apparitions on several levels—racial, gendered, religious and political. It demonstrates the overwhelming pervasiveness of this sorely understudied phenomenon as a central social element of the Spiritualist movement. The project establishes how the witnessing of Indian spirits affected American minds and the reception of federal Indian policy by influencing concepts of racial difference and socio-political hierarchy. The heart of my analysis examines the racial elements unique to the spiritual manifestations of Indians, as well as how American Spiritualists utilized the Indian spirits they claimed to encounter as sources of political empowerment—as agents of peace between whites and Indians, as models of sexual difference, and as guides to spiritual progression for both races. Spiritualists understood Indian ghosts to appear in séances with a mission to fulfill: to help ensure the inner illumination of Spiritualists, to support white attempts at social reform, and to serve as sources of strength to the female mediums they possessed. They acted as mediators between the material and spiritual realms, providing essential information about the condition and means of progression through the several spiritual spheres, and communicating the temperament and will of the supreme deity commonly referred to as the Great Spirit. Through Indian spirit appearances, Spiritualists were apprised of the Great Spirit’s attitude regarding social and political issues, such as the actions to be taken regarding Indian nations, political equality for women, or the correct position on congressional policies. The presence, strength, and support of Indian ghosts were recognized as contributing to the efforts and accomplishments of Spiritualists to create a “heaven on earth” that reflected the enlightened position of spirits. These spirits did not manifest predominantly as nostalgic symbols of a vanishing race. They appeared frequently in the 1860s to 1880s, when the United States was almost constantly at war with Indian nations, when debates about what to do with Indians raged, and when the future of the North American West was anything but certain. They did not simply appear as Indians who were better off dead in the Happy Hunting Ground, assuaging white guilt about conquests and an imagined vanishing, as has been suggested by many historians—such as Alan Trachtenberg in his writing of fictionalized Indians, Jared Farmer in his discussion of legends representing Indians as ghostly and most pointedly Molly McGarry in her chapter on Indian spirits. Indian spirits were also not categorized on the whole as being from the distant past and thus safely nonthreatening. Spiritualists saw Indian ghosts as awakening public outrage and inciting political opposition against the wars waged by the United States on Indians, causing Spiritualists to question government objectives in the West. Spiritualist publications vehemently denounced the Sand Creek Massacre of 1864, George Custer’s invasion of the Black Hills and the duplicity and corruption of American Indian policy, as exemplified in the Ponca Affair of the 1870s and multiple reports on dismal reservation conditions. Spiritualists recognized the support of Indian ghosts for peace policies and political equality, and the efforts of Spiritualists to restore what they felt their country, allegedly superior in religion and civilization, had lost—its sense of honor. They were not simply utilized as servants of the mediums who conjured them; they were praised as guides and instructors, helping to ensure the nation’s spiritual future. When Spiritualists closely followed the development of the Indian Peace Commission in 1867, the rise and decline of Ulysses S. Grant’s Peace Policy, the success of “civilized” tribes like the Cherokee, the Carlisle and Hampton Institutes and the implementation of the Dawes Severalty Act in 1887, they believed they were both heeding ghostly warnings and working to rebuild the pride of their nation. These major events in American/Indian relations are linked in this project to the intensity of Indian spectral appearances and their centrality to the Spiritualist movement’s contemporary development, serving as the basis for the powerful trop of the “Indian spirit guide,” which persists today. A deeper analysis than those by previous scholars of the manifestations themselves reveals the complex and sometimes conflicting nature of such phenomena. Scrutiny of the methods, acknowledgements, and purposes of Indian manifestations opens wide a door to a much richer understanding of how the intellectual and professional classes that comprised the foundation of Spiritualist Movement constantly redefined and integrated the concept of “Indian” into a society structured by racial and sexual difference. The notion of Indianness that emerged from Spiritualist séances advocated a politically non-racial society, whereby Indians could and should become American citizens, and incorporated gender models that undermined contemporary definitions of manliness as positively linked to violence. In using such terms as “Indian spirits,” I refer to manifestations witnessed by Spiritualists in which they claimed to see Indians, including cases of specifically named Indians, as well as those “Indianness” derived solely from Spiritualist identification. The ways in which Indian celebrities were authenticated and nameless “Indians” were recognized both reflected how “Indianness” as a scientific racial category was understood and constructed in the Spiritualist arena and, I posit, were reflective of broader American cultural attitudes. The actual presence of Indian spirits at nineteenth-century séances is neither accepted nor denied in this book. It is only relevant that Spiritualists accepted their experiences as truth. To assert at the onset that all Spiritualists were knowing frauds is risky and counterproductive. Such evaluations invite statements like those of Lisa Lenker, who in her research connected her discussion of Spiritualism with Manifest Destiny rhetoric as supporting the ethnic cleansing of the American continent. Lenker asserted that all Indian ghosts were simply and happily dead (not undead, as the term “ghost” suggests). The ghosts of Indians will often be described throughout this book from the perspective of the Spiritualists themselves—as distinct historical actors. To believers, these specters spoke, made claims and issued warnings. Writing about their alleged activity in such a way allows this book to delve into the responses and reactions of Spiritualists who believed these apparitions to be intelligent, active agencies. This approach to describing spectral activity is offset by the simultaneous focus on specific individuals deeply involved with Indian apparitions, including the mediums Jennie Lord, Mary Shelhamer, Fannie Conant, and Cora Tappan. Placing Spiritualist manifestations at the center of this project, essentially shifting the focus onto non-entities, is a somewhat unorthodox approach to the study of history, and has not been the practice employed by other scholars of Spiritualism. Yet doing so allows the incorporation of a body of literature on ghostliness and hauntings that is central to this project. Such scholarship has to this point been absent from Spiritualist studies, strangely so given that the movement, at its core, was about communicating with the dead. Rather than referring to these manifestations only as spirits from the celestial realm or as the products of an American imagination, I abstain from judgment on their existence. By using the labels that Spiritualists themselves did—ghosts of the dead returned to life—I employ a lexicon of definitions that are critical to understanding the full significance of Spiritualist encounters with such phenomena. “Ghosts” are undead—uncanny, temporal disruptions that appear in specific ways at specific times to deliver a message. Communication by such entities conveys information about an obscured past occurrence. To the witness of such phenomena, the presence of the ghost is made clear through a distinct sensory experience, its disruption of logical time remedied only by listening to what the ghost wants and providing it with satisfaction. It is with these terms in mind, originating predominantly in fictive, psychological and paranormal studies, that I look upon séance activities of nineteenth-century America. In his work on literary hauntings of America during the first half of the century (the period of federally sanctioned Indian removal), Renee Bergland rightly suggested that representations of Indian ghosts simultaneously established and questioned an intangible American nationality, as well as racial and sexual classifications. Examining how the Indian spirits of séances contributed to changing definitions of race and gender is the main thrust of this project. Organized by theme rather than time, the chapters included in this book cover the nature of Spiritualist hauntings marked as specifically Indian, and the questioning and redefinition of masculinity, femininity, and morality as linked to national progress that took place within séance circles beginning in the 1850s and continuing throughout the 1880s. This timeframe will be repeated in each chapter as different aspects of Indian hauntings are visited. A majority of works on Spiritualism have chosen to narrow their scope to the earlier, formative years of the movement. Studies about the Fox Sisters or Andrew Jackson Davis, for example, emphasize the Spiritualism of the 1850s as definitive of the entire movement. Bret Carroll highlighted the 1850s as an emergent period, as did Howard Kerr. Such an approach is not appropriate here. The frequency with which Indian manifestations were recorded was fairly comparable from the 1850s through the 1880s, peaking during the 1860s and 1870s. The decline that Burton Brown said occurred in the 1870s is not borne out by the increased frequency of Indian apparitions. The seemingly consistent presence of Indian ghosts at séances serves in part to bolster my argument that Indian ghosts were a defining characteristic of Spiritualist practice from its inception, and makes discussion of the movement through the course of the century imperative to my efforts. Both Indian policy and Spiritualism evolved in the twentieth century, and continue to do so, but analysis of such changes is beyond the scope of this book. My intention is to demonstrate how spiritual tropes of Indianness developed on the crest of Spiritualism in tandem with dramatic change in Indian visibility in the public eye. My focus on recorded instances of Indian specters also determines to a large degree the emphasis on certain sources at the expense of others. While myriad articles, pamphlets, treatises and monographs by Spiritualists provide this project with a contextual foundation for their beliefs, as well as Indian manifestations, the recording of Indian ghosts emerged predominantly in certain forms of Spiritualist print—namely, their periodicals. Newspapers played a critical role in the development and dispersion of representations of Indians that saturated nineteenth-century American culture and continue to do so. The majority of writing on such phenomena appeared in the Religio-Philosophical Journal and Banner of Light; these sources are therefore dominant forces in this project. My use of Banner of Light in this book works somewhat as a centralizing force in a movement which had none, and provides a modicum of order to the cacophony of Spiritualist voices. Banner of Light takes on an added significance in my research because of its extensive coverage of Indian affairs. The development of the Indian Peace Commission, the Modoc War, the Ponca Affair, and the violation of the 1868 Treaty of Fort Laramie were all covered and editorialized in the weekly journal, receiving consistent attention in a periodical ostensibly dedicated to matters of the spirit. The amount of space accorded to such news should not continue to be overlooked in the analysis of Spiritualist print. The longevity of the Banner of Light, enjoying an approximately fifty-year run, speaks once again to the pervasiveness within Spiritualism of this very specific racial phenomena. Geographically speaking, this project views Spiritualism as a national movement in a broad sense, with loci of activity in New York and Boston. As the sites of some of the first violent contests with Indian nations, the northeastern states have a well-developed “penchant for hauntedness,” as Judith Richardson claimed, “alongside a more enduring popular interest in ghosts and the supernatural.” Local variations of Spiritualism did not seem to have a significant impact on Indian spectrality, and so has been omitted from this project. The one exception to that is the Spiritual culture of New Orleans. The connection between this city’s history and the spirit of Black Hawk will be discussed in Chapter Two. Likewise, while there are many significant connections to be made with contemporary Spiritualist movements across the globe, this project’s focus is on American Indian ghosts within American Spiritualism, and the resulting effect on American society. This intention, juxtaposed with the virtual absence of similar phenomena in Europe, justifies the exclusion of such a discussion in this work. The references to Britain’s literary gothic tradition are brief, and useful only in demonstrating Spiritualism’s place among the gothic tradition of the western world. European Spiritualism is beyond the scope of this book. Additionally, this project is not about Indian spirituality in its own right, as there were no significant efforts on the part of Spiritualists to understand or incorporate Indian religions into their own belief system. Their interest in native spirituality extended to generalized ideas about animism and a natural Romanticism, which will be addressed in Chapter Four. The remainder of this introduction will serve several functions. It provides a background on aspects of Spiritualist theology that are essential to understanding the arguments made in this project, a discussion of Spiritualism and Indian hauntings in context with changes in federal Indian policy, a brief summary of the key goals and themes of each chapter, and a few words about the bodies of scholarship most directly engaged and built upon in this book. Mary Theresa Shelhamer, Life and Labor in the Spirit World: Being a Description of Localities, Employments, Surroundings, and Conditions in the Spheres by Members of the Spirit-Band of Miss M.T. Shelhamer, Medium of the Banner of Light Public Free Circle (Boston: Colby & Rich, 1885), 85-86. Alan Trachtenberg, Shades of Hiawatha: Staging Indians, Making Americans 1880-1930 (New York: Hill & Wang, 2004), 19; Jared Farmer, On Zion’s Mount: Mormons, Indians and the American Landscape (Cambridge: Harvard University Press, 2008), 312; Molly McGarry, Ghosts of Futures Past: Spiritualism and the Cultural Politics of Nineteenth-Century America (Berkeley: California University Press, 2008), 73. McGarry, 72; Robert Berkhofer, The White Man’s Indian: Images of the American Indian from Columbus to the Present (New York: Alfred A. Knopf, 1978), 90. Lisa Lenker, “Haunted Culture and Surrogate Space: A New Historicist Account of Nineteenth-Century American Spiritualism” (PhD diss., Stanford University, 1998), 30. Renee L. Bergland, The National Uncanny: Indian Ghosts and American Subjects (Hanover: Dartmouth, 2000), 7. Bret Carroll, “Unfree Spirits: Spiritualism and Religious Authority in Antebellum America” (PhD diss., Cornell University, 1991), 25. Howard Kerr, Mediums, Spirit Rappers and Roaring Radicals: Spiritualism in American Literature, 1850-1900 (Urbana: University of Illinois Press, 1973). Burton Gates Brown Jr., “Spiritualism in Nineteenth-Century America” (PhD diss., Boston University Graduate School, 1973). John Coward, The Newspaper Indian: Native American Identity in the Press, 1820-90 (Chicago: Illinois University Press, 1999), 11. The Banner of Light is regarded as the most widespread of Spiritualist periodicals. According to Sally Morita, by 1860 the periodical had a circulation of approximately 25,000. Ann Taves, Fits, Trances and Visions: Experiencing Religion and Explaining Experience from Wesley to James (Princeton: Princeton University Press, 1999), 184; Sally Jean Morita, “Modern Spiritualism and Reform in America” (PhD diss., University of Oregon, 1995), 78. Judith Richardson, Possessions: The History and Uses of Haunting in the Hudson Valley (Cambridge and London: Harvard University Press 2005), 39. Kathryn Troy has two Master’s Degrees in History from Stony Brook University. She contributed to the anthology The Spiritualist Movement published by Prager in August 2013, and teaches at Farmingdale State College and Suffolk County Community College. In her spare time she pours all she knows about the ghostly and supernatural into her fiction writing. 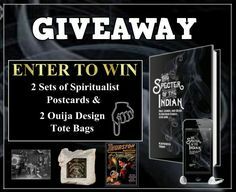 Kathryn Troy is giving away 2 sets of spiritual postcards and 2 Ouija design tote bags!